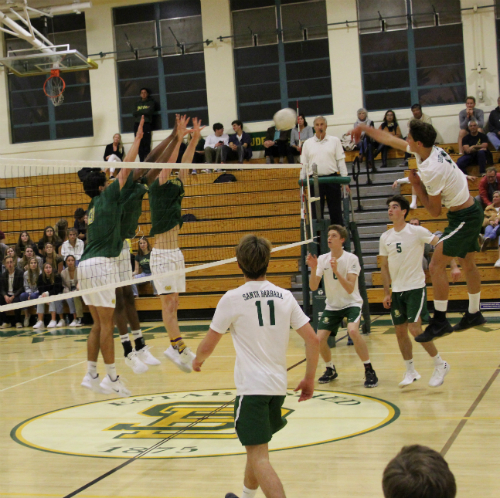 The annual matchup with perennial powerhouse Mira Costa brought the fight out of the Santa Barbara High boys’ volleyball team, but it wasn’t enough to capture a victory. The Dons failed to capitalize in critical moments late in sets and dropped the non-league match 25-22, 25-27, 25-18, 25-23 on Friday night. The Dons (2-2) have yet to hit their stride this season as key players Will Rottman and Aiden Douglas made their debuts against Mira Costa after a run in the state basketball tournament that ended with an overtime loss to Crescenta Valley Thursday night. Will Rottman hits from the back row. The Stanford-bound Rottman was the best player on the court and finished with match-high 25 kills. After fading late in set one, the Dons maintained their poise in set two. A kill by Rottam gave Santa Barbara a 25-24 lead. 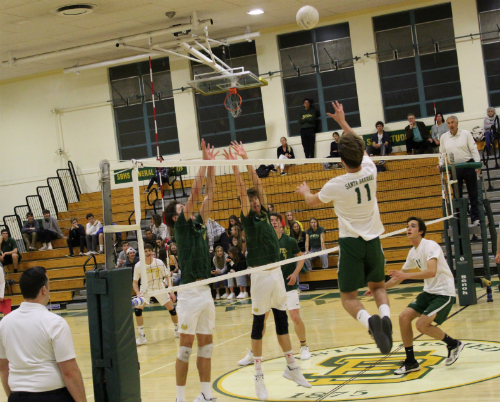 Mira Costa’s Dain Johnson evened the score at 25-25 with a kill off the Santa Barbara block, but A Mira Costa net violation put the Dons back in front 26-25 and Santa Barbara claimed the set, 27-25, when Ethan Young hit long. Any momentum that Santa Barbara built in the second set was halted by Mira Costa’s relentless execution. Mira Costa setter Jack Walmer spread the ball around to his attackers and the Mustangs clinched the third set on a kill by Johnson. In set four, Santa Barbara climbed to within 24-23 on a Mira Costa serve error, but Ben Coordt closed out the match with a powerful spike.